This page is dedicated to the memory of our local residents who answered the call to serve—in particular, during World War I. Lest We Forget. April 9, 2017, marked the 100 Anniversary of the battle of Vimy Ridge. The First World War battle that paved the way to an allied victory, solidified Canada as a sovereign nation, and became the defining moment of WWI that united Canadian forces and became a national symbol of achievement and sacrifice. From Mississauga, there were approximately 54 soldiers who fought at Vimy with 11 wounded and 7 killed. The soldiers came from the Villages of Malton, Streetsville, Meadowvale, Cooksville, Clarkson, Port Credit, Erindale and Dixie. Click here to visit our webpage that specifically honours the Battle of Vimy Ridge and activities surrounding its centennial anniversary. "Their Name Liveth Forever More"
Since 1921 the poppy has been used a symbol of commemoration of military personnel who have died in war. In the early 1960s, Donald J. Crawford wrote a poem called Why Wear a Poppy. The poem reflects on the reason why we 'remember' our fallen veterans on Remembrance Day in Canada and why we wear a poppy in their honour. Read Why Wear a Poppy. "Lady," said he, "may I have one?" And answered; "This is Remembrance Day. That's why we wear a poppy, you see. And became a man - as you will, too. And that's why we wear a poppy, son." Then said, "Thanks, lady, I'm glad to know. But your son - did he come back all right?" Though our freedom was bought - and thousands paid! Then wear a poppy! Remember - and Give! Dennis Ainger was born on January 11, 1893 in Norfolk, England to George and Sophia Ainger. He immigrated to Canada in 1912, and found work as a farmhand near Erindale in 1913, where he attended St. Peter's Anglican Church. 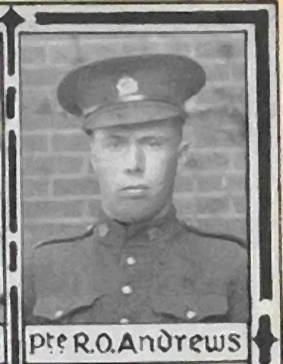 Dennis enlisted with the Canadian Expeditionary Force on August 2nd, 1915. As a Private, he was posted with the 75th Battalion of the Canadian Infantry, Central Ontario Regiment. His attestation papers indicate that he was 5'6" tall, of fair complexion, with blue eyes and brown hair. Private Ainger was killed in action on March 1, 1917 during an intelligence raid prior to the Battle of Vimy Ridge at age 24, and is buried in the Zouave Valley Cemetery, Souchez, near Pas de Calais, France. "We are the Dead. Short days ago We lived, felt dawn, saw sunset glow, Loved and were loved, and now we lie in Flanders Fields." Robert Oscar Andrews was born in Brampton on November 4, 1896 to Thomas and Sarah Andrews of Meadowvale. He lived in Toronto Township (now Mississauga) while he was a child, but was working in Brampton as a farmer when he was drafted as an early conscript under the Military Service Act in October 1917 at the age of 20. He fought overseas with the 75th Battalion for nearly a year, until he was killed in action. This took place on November 6, 1918 at the age of 22, during the capture of Marchpont, which was part of the Battle of Valenciennes, a minor battle of the 100 Days Offensive. He is buried nearby at the Aulnoy Communal Cemetery. Cyril George Bogg was born in England around 1895 to George and Sarah Ann Bogg. The family later immigrated to Port Credit, where Cyril worked as a labourer prior to enlisting with the 74th Battalion in July of 1915. He served in France with the 2nd Canadian Mounted Rifles, and sustained a wound prior to being demobilized in 1919. His father George also served overseas. Although he resumed work when he returned home, Cyril had contracted tuberculosis from gas attacks in the trenches, and died a few years later in December of 1921. He is buried at McPhail Cemetery and remembered on the Port Credit Cenotaph. Percival Brooks was born July 29, 1895, in Dixie, Toronto Township. He was the son of John Thomas Brooks, a gardener from England and his wife, Isabella Jane Curry of Cooksville. 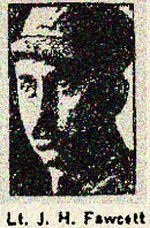 Percy, as he was known, enlisted at Toronto on 14th January 1916. On his attestation form he was described as 5 ft. 5 ¿ inches tall, with a fair complexion, light brown eyes, and brown hair. He was single, a stenographer by occupation, and had no previous military experience. He gave his father, John Brooks, of Islington, Ontario, as his next of kin. He was assigned to the 166th Battalion, the Queen's Own Rifles of Canada, and given regimental number 669746. The 166th embarked in two drafts in October 1916 for England, arriving at Shorncliffe Training Camp in Seaford, England. Principal drafts were transferred to the 3rd, 38th, 75th and 124th Battalions. Percy was sent to the 75th, known as the "Mississauga" Battalion. They had arrived in France on the 12th August 1916 where they served until the 2nd of May 1919, returning to Canada June 1st 1919. Sadly, Private Percival Brooks did not return to Canada. He was killed in action on 30th September 1918. 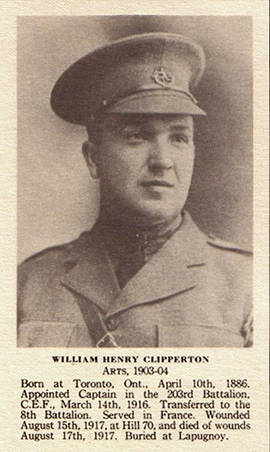 William (Billy) Henry Clipperton was born 1886 in Toronto, Ontario to William Henry Clipperton and Ida Madden. He was educated at North Toronto Collegiate and the University of Toronto. He moved to Streetsville in 1909 to teach at Streetsville High School and married Ena Mrytle Mae Graydon in 1911. William and Ena had two children; Graydon William (1912) and Irma (1915). Tragically, Irma died in 1920 in the second flu epidemic. William Clipperton answered the call to serve in 1915 when he enlisted from Winnipeg where he had moved in 1913 to become principal of LaVendrye School. He spent most of his two-year tour of duty in England, never reaching the Front and rose to the rank of Captain. At the end of his first tour of duty he re-enlisted and requested a demotion to Lieutenant so that he would be sent to the Front. He was wounded on August 15, 1917 at the second battle of Hill 70. He had led his platoon to its objective, high up on the captured ground, when he was shot by a sniper through the throat and lung. It was not possible to remove him at once, but eventually, after some hours spent in a dug-out, he was carried back to No. 18 Casualty Clearing Station, where he died two days later. William Clipperton is buried in the Commonwealth War Grave Cemetery at Lapugnoy and memorialized on the Streetsville Cenotaph and the family headstone in Streetsville Public Cemetery. Percy Joseph Devlin was born on October 29, 1886 in Erindale to William and Elizabeth Devlin of Sheridan. Percy continued to live in Erindale, where he remained single and worked as a nursery man until he enlisted with the Canadian Expeditionary Force in August of 1915. 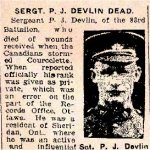 Just over a year later, Private Devlin was wounded at the Somme during the Battle of Courcelette on September 22nd, 1916. He was evacuated to a General Hospital, but died three weeks later on October 16th at the age of 30. He is buried at the Etaples Military Cemetery in France. Percy Devlin is forever remembered on the family headstone along with his parents, brothers and sister in Erindale Cosmopolitan Cemetery. Bert Case Diltz was born 1894 in Port Credit, Ontario, to Charles and Martha Diltz. 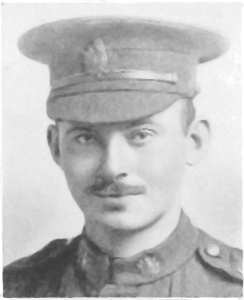 He was a student at the University of Toronto when he enlisted in February 1916. He served in the 4th Division's 10th Brigade signals company and his war service included Battles at Ypres (1917) and Cambrai (1918). Following the war, he completed his degree and earned an MA from Queen's University. Bert Diltz was a professor at the Ontario College of Education (OISE), and at the University of Toronto, serving as dean from 1958 to 1963. He was the author/editor of numerous books including texts for high school English courses. Bert has been described as "one of the profoundly influential shapers of teachers in mid-twentieth century Ontario", and was awarded an honorary degree by Queen's University in 1960. Bert Case Diltz passed away in 1992 at the age of 98. Alan Barrie Duncan was born in Unionville on April 15, 1897, to Presbyterian parents Kate Duncan and Reverend George Petrie Duncan. Alan was the youngest of three brothers and attended Parkdale Collegiate Institute, where he played rugby and was well-known in intercollegiate athletics. He enlisted on October 20 1915 when he was 18 years old, and a student. His description on enlistment tells us that he was 5'11" with blue eyes and dark brown hair, and worshipped at a Presbyterian church. Alan first went overseas in October 1916, and served through the battles of St. Eloi, The Somme, Passchendaele, Amiens, and Cambrai. After five months of service, he was struck with appendicitis and returned to Canada for an operation. Upon his return to France, Alan became the 42nd Parkdale student to be decorated when he earned a Military Cross for continuous good service. 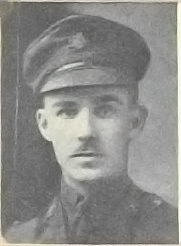 On the 14th of March, 1918, the Streetsville review reported that Alan had been promoted from lieutenant to captain of the 75th Battalion at the age of 19. His father, Reverend G.P. Duncan, served as chaplain in France, and two brothers also saw service overseas. Alan's brother George fell in 1915 at Festubert. Alan was killed in action on September 29, 1918 at the age of 21 while acting as second in command of his Battalion during an attack North of Cambrai. He went forward to ascertain the disposition of the Battalion but had only gone a short distance when he was instantaneously killed by enemy fire. Captain Alan Duncan is buried at the Marcoing Line British Cemetery near Douai, France. He is remembered on a stone at Dixie Union Cemetery and on the Port Credit Cenotaph in Mississauga. George Gordon Duncan was born in New Lowell, Ontario, on January 25, 1892, the eldest son of Reverend George P. Duncan and his wife. He was educated at Unionville Public School and Markham High School, and went on to attend University College at the University of Toronto for arts and medicine. Like many of his fellow soldiers from Port Credit, Gordon was active in the 36th Peel Milita and served there for four years as a lieutenant and acting captain. Until enlisting, Gordon worked at the Consumers' Gas Co. in Port Credit. He was eager to enlist at the start of the war in 1914 and, along with Alex Thomson, was one of the first Port Credit officers to go overseas. Gordon's younger brothers Wallace and Alan also fought overseas, and his father served as a chaplain in France. He left Port Credit in August of 1914 as a member of the 4th Battalion and reached France in February of the following year. He later transferred to the 10th Battalion, of which he became Adjutant. Gordon was wounded in April following the battle at Ypres and was killed in action on the 22nd of May, 1915 at the battle of Festubert. He is buried at Brown's Road Military Cemetery at Festubert, and also remembered on the Port Credit Cenotaph. Captain Reverend George Duncan was born in 1867 in Forfashire, Scotland. He later immigrated to Canada, settling in Port Credit, where he raised three sons with his wife Kate and served in the 36th Peel Militia as a Captain. George Duncan became Reverend of Dixie Presbyterian Church and later, Port Credit Presbyterian Church, before enlisting as chaplain of the 126th Peel Battalion. He went overseas in the autumn of 1915 and spent some time in England before being sent to France, where he transferred to the 10th Battallion. Capt. Rev. Duncan was with the 8th Battalion during the Battle of Vimy Ridge. Upon returning to Port Credit in the summer of 1917, George continued to support the war effort, praising the spirit and heroism of Canada's boys at the front from the pulpit and in community halls. He spoke passionately in favour of conscription, which was instituted in August of 1917. All three of the Reverend's sons also fought overseas. His eldest, Gordon, was anxious to serve the war effort and enlisted right away, leaving Port Credit in August of 1914. He served alongside his father during his time as adjutant in the 10th Battalion. 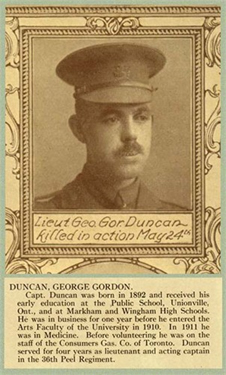 Gordon was wounded in April of 1915 at Ypres and killed in action in Festubert a few weeks later at the age of 23. His younger brother Alan Barrie Duncan enlisted at the age of 18 and served heroically; he was promoted to Lieutenant and awarded a Military Cross. Lieut. Duncan was also killed in action in 1918 during an attack north of Cambrai, France. Their brother Wallace S Duncan also served in France, and was coincidentally placed in charge of the 10th Battalion that his brother Gordon formerly headed. He won the Military Cross for his service at Vimy Ridge. 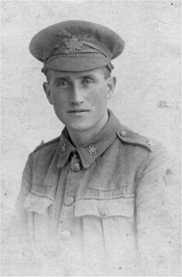 Wallace was the only one of his brothers to survive the war, having been discharged after he sustained a wound at Vimy. James William Dunn was born Sept 14, 1893 in Norfolk, England to Oscar and Sarah Ann Dunn. He immigrated to Canada, settling in Streetsville where he worked as a butcher. James enlisted on November 1, 1915, shortly after the first recruitment meeting was held in Streetsville, where he and ten other boys from the village pledged to enlist. The Streetsville Review wrote that it was "a fine showing for a small place like Streetsville and reflects credit on this loyal old village. The men who are enrolled are a fine class of fellows and every one of them will be sorely missed." Before Private Dunn went overseas he was presented with a safety razor by the brothers of the Oddfellow's hall, of which he was a beloved member. The Review reported that James Halsey, Noble Grand of the Oddfellows said "In presenting this to you, it is our hope that while you are fighting "Somewhere in France," or wherever you may be, your "closest shave" will be one from this razor." In 1916, Dunn went overseas but continued to stay in touch with Streetsville friends through letters, several of which were published in the Review. For Christmas that year, the women of Streetsville Methodist Church sent James and many other Streetsville boys a 'Christmas box' of dates, hand-knit socks, and cigarettes. Pte. Dunn fought with the 3rd Battalion until August 31, 1918, when he was killed by enemy shell fire while manning a machine gun outpost at Arras, France. He was evacuated immediately but died shortly after, at the age of 24, and is buried nearby at the Faubourg-D'amiens cemetery. He is remembered on the Streetsville Cenotaph. Charles David Evans was born March 23, 1898, to Ephriam and Mary (Sproule) Evans. A native of Streetsville, Charles enlisted with the Canadian Expeditionary Force in August of 1916. Before his departure for the front, a newspaper article reports that a farewell supper was given in his honour hosted by his uncle, Mr. W.J. Betts. His other uncle, Stanley Evans presented him with a wrist watch with the hope that he may return safely to wear it as a lasting treasure. He served with the Canadian Motor Machine Gun Corps, 3rd Division and participated in the battles at Arras, Cambrai, Doui and Mons. He was the youngest soldier to go overseas from Streetsville. Charles survived the war and returned home to Streetsville. He is buried alongside his family in Erindale Cosmopolitan Cemetery. James Fawcett was born April 8th 1889 in Streetsville, Ontario, to Alexander Robert Fawcett and Margaret Carberry. Howard, as he liked to be called was a Journalist, and a renowned hockey and lacrosse player. His brother Robert Cecil Fawcett fought with a Canadian Highland Battalion and his father was the editor of the Review, the first weekly newspaper publication between Toronto and Windsor. James fought with the 4th Battalion and died of his wounds at Vimy Ridge April 11th 1917, from a gunshot wound to his left arm and right leg. James is buried at Aubigny Communal Cemetery Arras, France. Arthur Fry was born in Surrey, England on July 6th 1892. He immigrated to Canada with his sister, Mary, around 1912. Mary lived in Toronto at King and Spadina while Arthur worked in Port Credit as a gardener, and later a farmer on Hobberlin Farm. Pte. Fry, who had previously served in the army service corps, enlisted in August of 1915 in Toronto. His attestation papers indicate that he was 5'9" with brown eyes and dark hair, and belonged to the Church of England. Arthur went overseas with the 92nd Highlanders and was later transferred to the 42nd Battalion. He was killed in action on his first trip to the Somme on October 5, 1916. He fell during operations near Courcelette when he was hit in the back by an enemy bullet. Pte. Fry has no known grave but is honoured at the Vimy Memorial at Pas de Calais, France. Angus Douglas Gray was born on December 11, 1895, the youngest son of John and Jessie Gray of Port Credit. His father, John Gray, was president of the St. Lawrence Starch Company in Port Credit. 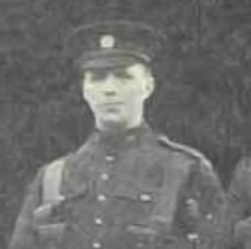 Before enlisting in August 1915, Douglas attended University College at the University of Toronto and served for three years in the 36th Peel Active Militia. According to his attestation papers he was 5'10" with a fair complexion, green eyes, and light hair. 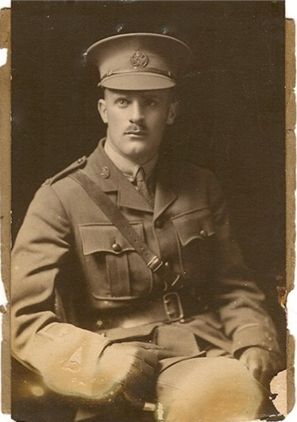 Lieutenant Gray went overseas with the 4th Battalion of Peel. He was wounded in October of 1916 and recovered at home in Port Credit until returning to the front the following January. 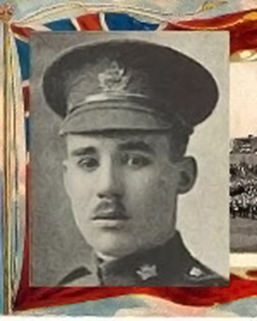 He received a Military Cross for his "conspicuous gallantry and devotion to duty" at the battle of Vimy Ridge, where he continued to support the withdrawal and counter-attack of his battalion as a gunman, even after suffering a wound to his forearm and the loss of one eye. 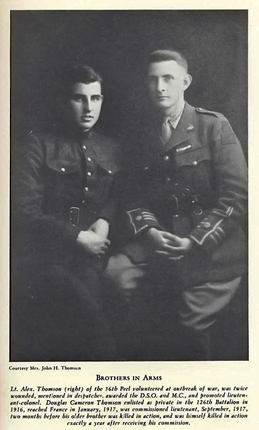 Douglas' half-brothers Captain James Gary and Lieutenant Andrew Gray also served overseas, and his mother Jessie supported the war effort as president of the local Red Cross Society. Angus Douglas Gray died at home in Port Credit of pneumonia resulting from influenza on October 25 1918 and is buried at Dixie Cemetery. Floyd Everard Graydon was born April 20, 1880, one of seven children of Sarah Jane (née Sterling) and Robert Graydon of Streetsville. Floyd's father Robert worked as Streetsville's postmaster for 50 years from 1870 until his death in 1920, and designed the first commemorative postmark for Queen Victoria's Jubilee in 1887. Floyd was an unmarried commercial traveller in Western Canada. He enlisted in WWI in July of 1916 in Winnipeg, Manitoba, and sailed from Halifax in October of that year. He was quickly promoted to Sergeant in November, and spent a year in England completing special bombing training and serving as an instructor before arriving in France a year later. His brother Eldred was a private with the 126th Battalion. Sgt. 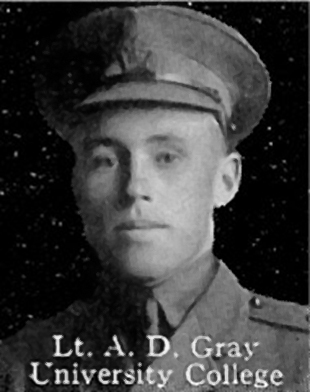 Foyd Graydon was killed in action on the Bois du Vert by machine gun fire while taking part in operations South of Monchy on 28 August 1918. He is buried at the Vis-en-Artois British Cemetery near Arras, France. Floyd's sister Ena was married to William Henry Clipperton (also featured on this page). Floyd Everard Graydon is remembered on the Streetsville Cenotaph and on the Graydon family headstone in Streetsville Public Cemetery. Frederick William Hill was born April 19th 1894 to Richard Hill and Grace Eddy, in Port Credit, Ontario. He had three brothers and seven sisters. Fred married Norma McNiece in 1926 they had one child, Robert Frederick born in 1927. 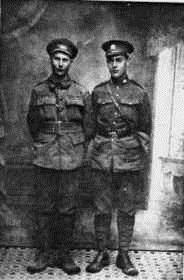 In the picture above Frederick stands to the right of his brother Arthur, with whom he fought at Vimy Ridge. 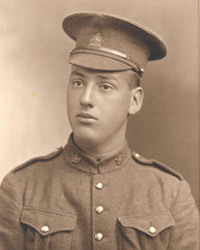 Frederick joined the Canadian Expeditionary Force in January 1916 with his younger brother Arthur, who was under age. It may be for this reason that records of his service remain challenging to find. There are however pictures of the two brothers in uniform. He eventually served at the Battle of Vimy Ridge in 1917 with the 15th Canadian Machine Gun Company. He was badly wounded at Vimy and did not return to France. Frederick William Hill passed away September 18th 1931, in York, Ontario. He is buried at Pine Orchard Friend's Cemetery, Whitchurch-Stouffville. George Hostrawser was born on July 8, 1897 in Malton, Ontario to parents William and Jane Cameron Hostrawster. 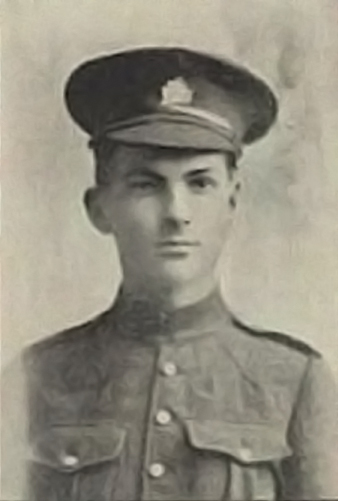 As a teenager he worked as a farmer in Malton until he enlisted in September of 1915 at the age of 18. George's attestation papers indicate that he was 5' 7¿" with fair hair and grey eyes. He went overseas with the 116th Battalion and was later promoted to Sergeant. George was killed in action on October 31, 1917 near Passchendale at the age of 20. He is buried at the Oxford Road Cemetery in Belgium. Thomas Laird Kennedy was born on August 15, 1878 on a farm near the Dundas and Tomken (named after him) intersection in Cooksville/Dixie. He was educated locally and at the University of Toronto. During the First World War he served with distinction and later attained the rank of colonel in the militia. Most of his life he was a fruit grower, concerned with farming and rural affairs and was highly respected by his fellow farmers. In 1919, he was elected to the provincial parliament as Conservative member for Peel. He retained this seat, with the exception of one term, until his retirement in 1958. Kennedy served as Minister of Agriculture from 1930-1934 and from 1943 until 1952. In 1948, he became interim Premier of Ontario. Kennedy remained in office until 1949. Kennedy's service and his great personal popularity earned him the affectionate title of "Old Man Ontario." He died on February 13, 1959, and is interred at Dixie Union Cemetery. Charles John Nairne Lee was born on February 11th, 1892 to Susan Taylor and Charles Nairne Lee of Dumferline, Fifeshire, Scotland. Charles is connected to Port Credit through his close ties to his aunt and uncle, Mr. and Mrs. Fred W. Lee, who lived there. He enlisted in the 169th Battalion in 1915 and utilized his experience as an officer in the militia, serving as an instructor at Shorncliffe, England. 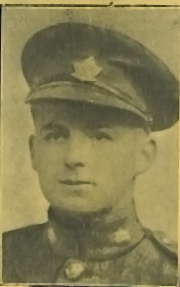 Charles was promoted to lieutenant of the 54th Battalion, with which he fought in France. Charles John Nairne Lee was killed in action by an enemy shell on September 27th 1918, while occupying a trench north of Bourlon Wood during the advance to the company's objective. He is buried nearby at the Bourlon Wood British Cemetery. Flag and staff were presented to the Port Credit Chapter, I.O.D.E. on the 24th of April, 1924, by Mrs. Fred W. Lee, in his memory. John Leviston was born on August 31st, 1884, in Lancashire, England to George and Elizabeth Leviston. In England he served for two years in the King's Own (Infantry) Regiment of Lancaster. John later immigrated to Canada alone and lived in Port Credit, where he worked as a grocer and joined the 36th Regiment Peel Active Militia. 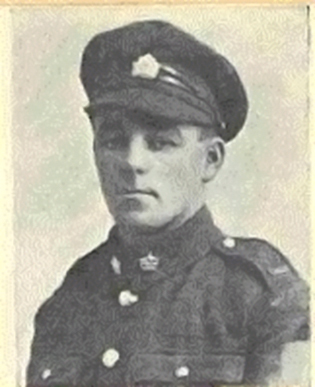 He enlisted on September 22nd, 1914, and served overseas with the 4th Battalion, Central Ontario Infantry Regiment. 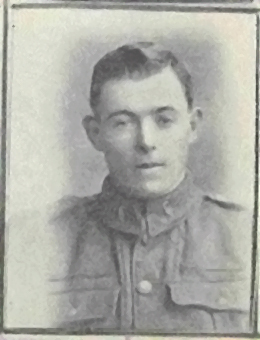 Private Leviston was killed in action on April 23rd, 1915 near St. Julien, at the age of 28. He has no known grave, but is remembered on the Ypres Menin Gate Memorial in Belgium and on the Port Credit Cenotaph. 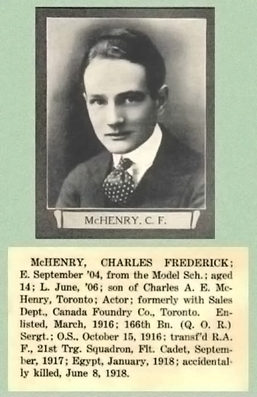 Charles Frederick McHenry was born in 1890 in Toronto, Ontario. He was educated at the Model School in Toronto and Upper Canada College. Charles worked professionally in the office of the Canada Foundry Company in Toronto, and later moved to Erindale where he married Donalda O'Neill. According to his obituary, he later joined the "dramatic profession", and became an actor in New York. He returned to Canada to enlist when the Great War erupted in Europe, enlisting in 1916 with the Queen's Own Rifles as a machine gunner. Charles was retained as a machine gun Sergeant Instructor in England. He then joined the Royal Air Force, was assigned to the 195th Squadron, and was sent to Egypt for training. John Moore was born on November 13, 1894 in Malton, Ontario to Irish parents John and Mary Moore. One of four children, John remained in Malton, where he was working as a farmer when he enlisted in November of 1915. Private Moore fought in France with the 18th Battalion until he was killed in action on August 28, 1918 at Vis-en-Artois. He is buried at the Vis-en-Artois British Cemetery Southwest of Arras, France. Private John Moore is also remembered on the family headstone in Moore's Cemetery. Fletcher Oswald Miller was born in 1894 to parents William and Arminella (Waite). Raised on the family farm at Lisgar, he attended Eden School, the Streetsville Grammar School and the University of Toronto. His uncle, John (Jack) Miller was a well-known police inspector in Peel and Halton Counties and Fletcher is said to have both worked for and been inspired by his uncle's example. He was of Methodist faith and reported to be both of quiet demeanor and a strong supporter of his family church, the Eden Methodist Church. Fletcher, whose listed profession was bookkeeper in Streetsville, enlisted in the Canadian Infantry, Canadian Expeditionary Force, on August 24, 1915. 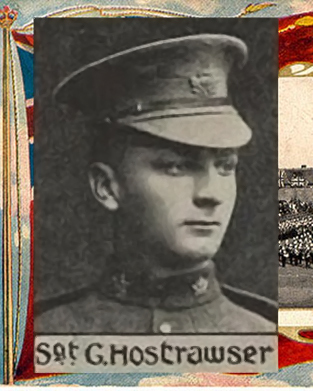 Overseas he was stationed with the 116th Battalion of the Canadian Infantry and was killed in action in 1917. Fletcher Oswald Miller is buried in the La Chaudiere Military Cemetery near Pas de Calais, France. His name is forever remembered on the Miller family stone in Eden Cemetery. 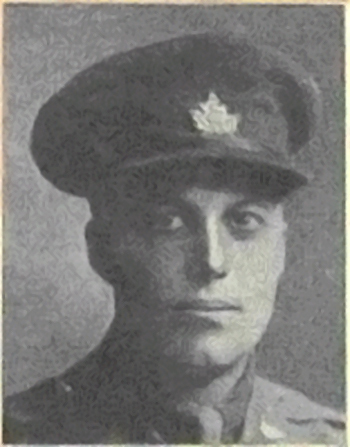 Franklin Walter Ott was born August 1st, 1893, in Brantford, Ontario to Emma M. Ott and Lieut. Charles A. Ott of Dufferin Rifles. He attended Parkdale Collegiate Institute and went on to study law at the University of Toronto. In March of 1915, while still a law student and living at 84 Walmer St., Toronto, Franklin enlisted with the 25th Varsity Battery and went overseas in June. He narrowly escaped death in the Zeppelin raid over Otterpool, England, in October of that year, and returned to Canada before his mother's death in December. Franklin went back overseas in August, 1916, and transferred to the 116th Battalion. He served at the Battles of Vimy, St. Eloi, Lens, Hill 70, Passchendaele, among others. Captain Ott was mentioned in despatches by General Haig in April 1918 for gallant and distinguished services in the field, and was awarded a Military Cross. He was killed in action on September 17, 1918, at the battle of Arras when he was struck by a shell in a trench with his colonel and two other officers. He was 25 years old. Franklin Ott is buried at the Monchy British Cemetery in Pas de Calais, France and is honoured by an individual memorial at Trinity Anglican Church in Port Credit. Egerton "Edge" Arthur Sayers (1894-1918) was the second son of Catherine and Charles Sayers and the brother-in-law to Annie Harris Sayers (Benares, Mississauga Museums). At the outbreak of the War, Egerton Sayers was living in Clarkson working as a bank clerk. Unlike his brother Beverly, Egerton was free of family responsibilities and joined up on 10 November 1914. 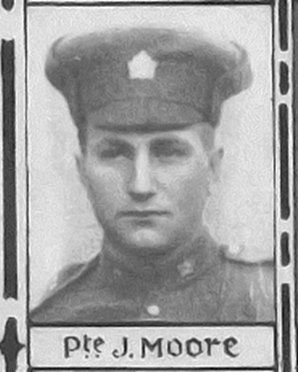 While undergoing training in Toronto, Private E. Sayers contracted the mumps and spent a month and a half in hospital. Sailing overseas in May 1915 Private Sayers was posted to the 19th Battalion and went into the trenches of the Western Front in September. During the Battle of the Somme, September 1916, Private Sayers was wounded by shrapnel in the arm and stayed in various hospitals in England until November recovering from wounds received in battle. Granted a furlough, Egerton returned to Canada in February 1917. For two months Egerton Sayers stayed in Clarkson resting before returning to the Front in April. By January 1918 he had been promoted to the rank of Lance Corporal. Lance Corporal Egerton Sayers was killed in action June 21, 1918, while the 19th Battalion was occupying a defensive line. Egerton Sayers is buried in Bellacourt Cemetery, Pas de Calais, France. Harold Edwin Statia was one of eight children born to Vance A. Statia and Mary Susan Church in Streetsville on August 9, 1894. The family left Streetsville in 1899 and moved to Orangeville. Prior to enlisting at the outbreak of the war in September of 1914, Harold worked as a printer and editor of the Streetsville Review and served in the Active Militia with the 60th Rifles of Canada. Several of the letters he wrote to his family from France were published in the Review. They describe the mud and rain, delight at receiving a tin of biscuits, and running into other soldiers from Streetsville. Harold attained the rank of Corporal before he was killed in action on October 8 1916 at the age of 22, while fighting at the Somme in Flanders. He was buried at the Adanac Military Cemetery in France. Corporal Statia is remembered on the Streetsville Cenotaph and many of Corporal Statia's siblings are buried in Streetsville Public Cemetery. Alexander and Douglas Thomson were born in Port Credit in 1888 and 1898 respectively, to John and Lillian Blakley Thomson of Port Credit, Ontario. Both served during the First World War. Alexander was wounded in April 1915 but returned to the front and earned promotions based on his strong leadership. In 1916 he was promoted to Captain and awarded the Military Cross. That fall, he became a Major and received a Distinguished Service Order. At the Battle of Vimy Ridge, he acted as second in command of the 10th Battalion. In June of 1917, he was given command of the 4th Canadian Infantry Battalion and was promoted to Lieutenant Colonel. 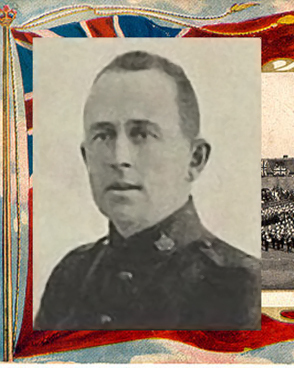 Lt. Col. Thomson was killed by a sniper at the Battle of Passchendaele in November of 1917. It was written in the Streetsville Review that "No braver soldier, no finer man, than Alex Thomson, crossed the ocean since war begun." He is remembered at the Port Credit Cenotaph in addition to a memorial plaque at the Mississauga Masonic Temple. 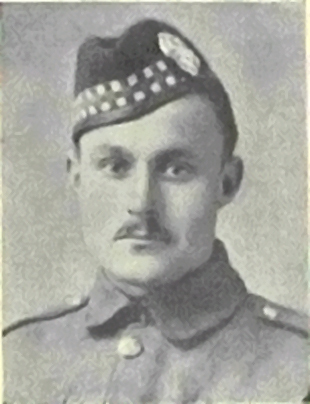 Douglas Cameron Thomson enlisted as private in the 126th Battalion in 1916, and reached France in January 1917. He was commissioned lieutenant in September of that year, two months before his older brother was killed in action, and was himself killed in action exactly a year after receiving his commission. George Henry Tolman (Harry) was born in Cooksville, in 1894, to parents Albert and Sarah (Readman) Tolman. He was only 22 years old when he enlisted in 1916. His attestation papers list his profession as Chauffeur. Harry survived the war and died in 1930. He is buried in the family lot at Erindale Cosmopolitan Cemetery. Arthur Whitehead (middle) and his twin brother Robert (bottom) were born on July 1, 1896 in Elmbank, Ontario to Robert and Elizabeth Whitehead of Malton. At the time of his enlistment in June of 1916, Arthur was living in Medicine Hat, Alberta and working as a farmer. He served with the 31st Alberta Regiment for about two years before he died from wounds he sustained during service on February 6, 1918 at the age of 21. He is buried at the Sucrerie Cemetery at Pas de Calais, France. 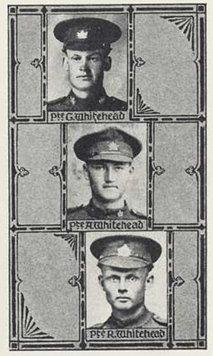 Arthur's brothers Robert and George (top) also enlisted with the Canadian Expeditionary Force. Robert was the first to fall, dying from pneumonia he contracted while training in England on July 17th, 1916 at the age of 20, and is buried at the Shorncliffe Military Cemetery in Kent, England. 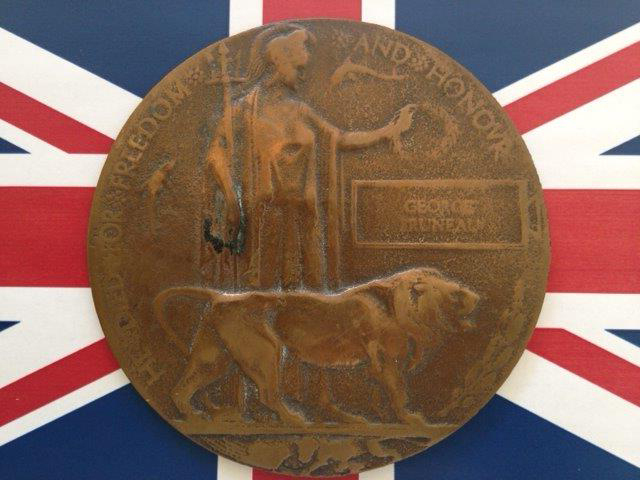 George was killed in action on March 30th, 1917 at the age of 25 and is buried at the Ecoivres Military Cemetery at Pas de Calais, France. The Memorial Plaque was issued after the First World War to the next-of-kin of all British and empire service personnel who were killed as a result of the war. The plaques were made of bronze, and hence popularly known as the "Dead Man's Penny", because of the similarity in appearance to the somewhat smaller penny coin. In total, approximately 1,355,000 plaques were issued. This token includes an image of Britannia holding a trident and standing with a lion. The designer's initials, E.CR.P. appear above the front paw. In her left outstretched left hand Britannia holds an oak wreath above the rectangular tablet bearing the deceased's name cast in raised letters. The name does not include the rank since there was to be no distinction between sacrifices made by different individuals. Two dolphins swim around Britannia, symbolizing Britain's sea power, and at the bottom a second lion is tearing apart the German eagle. The reverse is blank. Around the picture the legend reads (in capitals) "He died for freedom and honour", or for the six hundred plaques issued to commemorate women, "She died for freedom and honour".